At the Bijou Grille on Main Street downtown, Michael Henry will tell you his boss considers him to be the "best No. 1 dishwasher of all time." "I'm legendary," he said with serious aplomb. To executive chef Michael Greco, Henry, who has a learning disability, is one of the guys. They've worked together for 10 years. "He always comes in. He's always on time," Greco said. "I don't have to worry about things, which is good. In this business it seems like everyday you're worrying about something." Henry is among an estimated 2,000 to 3,000 local people with developmental disabilities -- which can include mental retardation, epilepsy, cerebral palsy -- who are part of what one human services worker called a "revolution" in the working world. People with these disabilities, classified together because they begin at birth and can interfere with working or learning, are more commonly employed in offices, hotels, restaurants, groceries and factories than they used to be.A growing list of businesses, which can save money by hiring people with disabilities, have been employing with help from one of the 29 Western New York training agencies, such as Goodwill and People Inc. The Adam's Mark Hotel, Briarwood Country Club, HSBC Bank, Kohl's department store, Tops and Wegmans are among 16 local employers singled out for an October awards luncheon to honor National Disabilities Employment Awareness Month. "As the United States faces a shift in demographics and a loss in our work force, one of the things that we need to be doing is looking at non-traditional workers," said Susan Piper, regional coordinator at Vocational and Educational Services for Individuals with Disabilities, or VESID. "We are fast approaching a point in time when we do not have the luxury of walking by these people." While there are still "sheltered" workshops where workers with disabilities work together refinishing furniture, or doing piecework, such as labeling, social service agencies now routinely help people find outside jobs. With extra training from job coaches, workers get help with job interviews and regular on-the-job visits to negotiate problems. To lure employers to hire employees with disabilities, there are government tax breaks of a little more than $2,000 each year for the first two years. Another tryout program offers to reimburse businesses for a month's wages, whether or not an employee works out. Numbers gathered from among the agencies in Western New York reveal that each year for the past three years some 400 people with developmental disabilities got new jobs and held them, said Piper. Even more have been working for many years, as Henry has. Piper estimated that between 2,500 and 3,000 people with developmental disabilities are now at work both at local businesses and in sheltered workshops. Job coaches are part of what make the workers endure. Coaches come from People Inc., based in the Town of Tonawanda, to make regular visits at the Bijou, just as they do at other work places. They tackle whatever issues a staffer or an employer needs help with, such as a worker wearing the same clothes two days in a row. 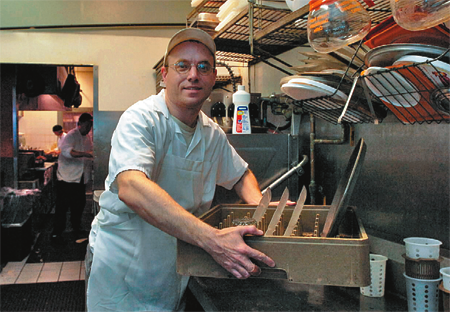 "Basic things I wouldn't know how to handle, the job coach handles," said Chef Greco, who was in the midst of hiring another dishwasher through People Inc.
Noreen Murphy has cerebral palsy with some physical limitations, but as director of counseling services for VESID, where she has worked for 19 years, she doesn't need a job coach. Since she cannot see well, her office computer shows letters in a type size she calls "humongous." She doesn't drive and will get reimbursed for cab fare to a meeting. "It's become more of a standard way of doing business," said Murphy of hiring workers with disabilities. "Still, people with disabilities are the largest segment of the population that remains unemployed and underemployed." About 57 percent of people with disabilities are employed, compared to 77 percent of non-disabled, according to 2000 Census data cited by the Center for An Accessible Society, based in San Diego. For Wanda Jones, president of In Room Plus, which packages toiletries and snacks for hotel mini bars, employing and offering public school-arranged internships for people with disabilities makes her feel connected to the community. "They're certain jobs they can do as well as anybody else," said Jones, on a tour of her company's assembly room on a floor of the Main Street Tri-Main building. She stopped by Jim Podanowski, who was newly hired through Goodwill. He was filling jars with cashews bound for mini bars. He said he liked the job because there was variety among the jellybeans and toothbrushes and toothpaste that get specially packaged. "It's all right," he said, looking up. "It works out for me." While Allentown Industries, headquartered on Oak Street downtown, has about 80 workers with developmental disabilities now looking for jobs, it helps employ 725. About 300 have work at places such as Wegmans, Tops and Cheektowaga's Smokey Bones restaurant. About 120 refinish furniture at workshops in Hamburg and the Town of Tonawanda. Another 300 have seats in a huge warehouse-like room with tables. Last week, people quietly worked, talked and laughed as a they put sponges into boxes for one manufacturer and labels onto bottles of night cream for another. "It takes me a while to catch on," said Phyllis Feaster, after carefully smoothing on a label. "I like learning to do different things." For plant manager Doug Theile at Innovative Chemical Corp. in Amherst, being able to send out the night cream when his machines can't maneuver the curved bottles, is a boon. People at Allentown also filled some 2 million plastic containers of the popular "Floam" toy putty his company makes. "When you come right down to it, we do save money," said Theile, whose daughter is a supervisor at Allentown. "The people there are a lot easier to work with . . . I think they appreciate everything very much." At the workshop, earnings are calculated by how much work a person completes in an hour. Pay can range from 50 cents an hour to $7. But it is the work, and being part of a team, not the pay, that matters to people, said Mark McVay, director of adult services for Allentown Industries. "Our guys take a lot of satisfaction. I see it on their faces," he said. When McVay started his career 26 years ago, most paycheck work happened in a workshop. One or two people had jobs in the community. Now with the Allentown number closer to 300, he can tell businesses have changed along with schools, where students with disabilities study along with everyone else. "It's what we do in our culture," he said. "We all participate and work." For Michael Henry, 45, work at the Bijou Grille is part of a life that includes an Allentown apartment, taking care of his cat Spooky and watching American Bandstand often enough to know that the rap group Run DMC made an appearance in 1985. He once turned down an offer from Greco to advance and learn to cook the menu. For Henry the pleasure of work is in the rap radio station he listens to softly so diners can't hear, the co-workers who know he likes strawberry cake and coffee with cream and the hot soapy water he uses to get the pans sparkling clean. "I like the dish washing the best," he said.